On Friday evening, when thousands of people of Kumarattipalayam village gathered near the Chidambaram Nagar bus stand in Thoothukudi, it was thought the protest would be just yet another demonstration against the Sterlite copper plant. 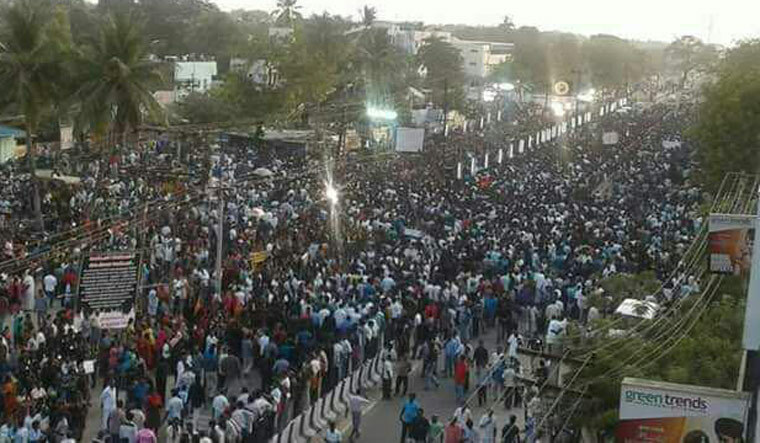 But the protest turned out to be massive, as more than 12,000 shops in the whole of Thoothukudi town were shut down; moreover, the protest continued through the night, picking up momentum as students joined the protesters on Monday. A year after the Jallikattu protests, which were a massive success in Chennai and other parts of Tamil Nadu, the Thoothukudi protest has shaken the state. Claiming that the copper plant was polluting the air, groundwater and flow of the Thamiraparani river—considered a lifeline of Thoothukudi and Tirunelveli districts—the villagers of Kumarattipalayam came together demanding the shutdown of the Sterlite copper smelter plant, which is part of the $12.9 billion Vedanta group. Sterlite Industries (India) Limited is a subsidiary of Vedanta Resources plc, the London-based FTSE 100 metals and mining group. The plant, according to the villagers, was polluting the air and groundwater owing to poor effluent management by Sterlite. “There are 50 trade associations here in Thoothukudi. We all had extended one-day support. We will not allow the plant expansion to happen. Sterlite has already eaten our health and wealth,” tells M. Krishnamoorthy, one of the coordinators of the protest. Around 12,000 shops in the locality were shut down. On Saturday after the protest became massive, the Sterlite group had said that it had clearances for expansion. Sterlite Copper is planning for expansion of facilities requiring expenditure of Rs.3,300 crore. Stating that “Zero discharge systems, utilisation of waste for sustainable applications, energy-efficient systems and stringent emission monitoring are the hallmark of Sterlite and these will only be strengthened through the expansion,” Sterlite's management in a statement said that their primary commitment is to ensure development and well-being of the communities around its operations. Sterlite, apparently, had witnessed shutdowns due to protests on and off in the past two decades. It was in 1998, after hearing a petition filed by a local politician, the Madras High Court had ordered closure of the smelter. The High Court had given an interim order to close the plant in November 1998. The plant, which opened within a month after the court order in 1998, gave an assurance to stop pollution. It assured to take necessary measures for stopping pollution as suggested by the National Environmental Engineering Research Institute (NEERI). Again, protests erupted and when petitions were filed in court and Sterlite failed to follow NEERI’s suggestions in 2010, the Madras High Court ordered shutting down of the factory permanently. The Supreme Court, in its verdict in March 2013, said the plant was a big source of employment, copper and revenue and that it had cleaned up its act. In 2013, the Supreme Court had fined Sterlite for polluting the land and water in the area after a gas leak. The court had also rebuked the plant for operating without permits for some time. And now after years, with Sterlite gearing up for expansion, protests have erupted again. “For them, its copper, which turns into crores of revenue. For us, it is cancer. The environmental health dangers like cancer have pushed us to protest. Children are the most affected. We will not give up till the plant is shut down permanently,” tells Fathima Babu of the Anti Killer Sterlite People’s Movement. Meanwhile, just like it was during the Jallikattu agitation, cine artistes have announced support for the protest against Sterlite. Actors Vivek and Kamal Haasan—who ventured into politics officially last month—have announced their support for the protesters.